TIPTON, CA. 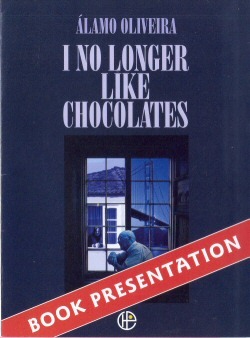 : The formal launching of I No Longer Like Chocolates – the English translation of author Álamo Oliveira’s novel of emigration from the Azores to California, Já não gosto de chocolates – was celebrated on 2 April 2006 by Portuguese Heritage Publications at the Tipton S.P.D.E.S. Hall, in conjunction with the 30th Annual Luso-American Education Foundation [LAEF] Conference in Tulare. Deolinda Adão of the University of California-Berkeley addressed the audience and filled in for translator Katharine Baker, reading excerpts from the novel with translator Diniz Borges. Álamo autographed copies of the book afterwards, then Tipton's S.P.D.E.S served an authentic Azorean sopas luncheon. 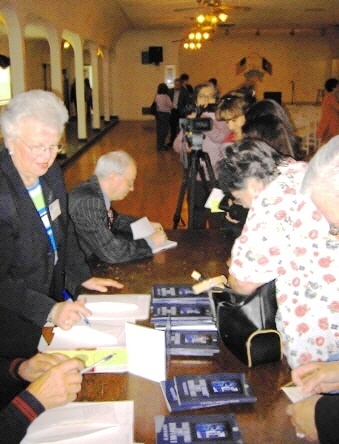 Photo, upper left: Bernadine Goularte of Portuguese Heritage Publications coordinates the signing table as Álamo Oliveira autographs copies of I No Longer Like Chocolates. Click here to see more pictures of the Tipton event. BERKELEY: Morrison Library, University of California – preceded by The Lady and the Rose: Conference on the Portuguese writer Natália Correia, Deolinda Adão chair. 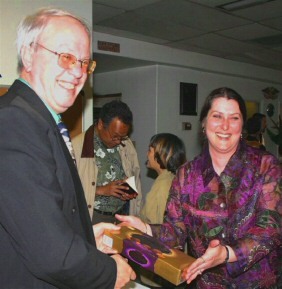 During the 6 April 2006 book presentation Deolinda – coordinator of Cal's Portuguese Studies Program – addressed the audience, then filled in for translator (and "Old Blue") Katharine Baker, reading excerpts from the novel with translator Diniz Borges; Álamo autographed copies of the book afterwards. 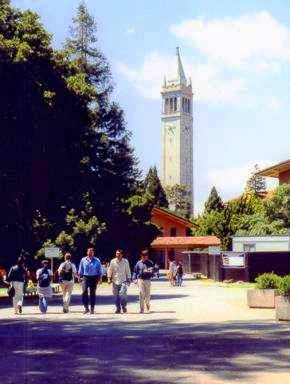 Photo, lower left: College Avenue/Bancroft Way entrance to the University of California campus, with its landmark Campanile bell-tower in background. GILROY: I.F.D.E.S. Lodge – hosted by the Gilroy Sister Cities Association, the Gilroy I.F.D.E.S. and Mayor Al Pinheiro. On 7 April 2006 Deolinda Adão and translator Diniz Borges read excerpts from the novel, then Álamo autographed copies. Photo, upper right: Author Álamo Oliveira addresses the audience at the I.F.D.E.S. Lodge; seated (r.), translator Diniz Borges. Click here to see more pictures of the Gilroy event. TURLOCK: Parish hall of Our Lady of the Assumption National Portuguese Church – hosted by Dr. Elmano Costa of California State University Stanislaus/Turlock and the Portuguese Education Foundation of Central California on 8 April 2006. Translator Diniz Borges read excerpts from the novel; Álamo autographed copies of the book afterwards. 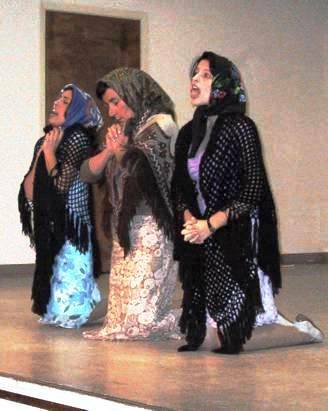 Photo, middle left: A performance of Álamo Oliveira's play Bocas de mulheres [The Mouths of Women] followed presentations of I No Longer Like Chocolates in Berkeley, Gilroy and Turlock – here on stage at Our Lady of the Assumption parish hall. The actors – from Angra do Heroísmo, Terceira's Alpendre Theater – are, left to right, Maria do Carmo Amaral, Judite Parreira and Filomena Ferreira. Click here to see more pictures of the Turlock event. SACRAMENTO: The Sacramento Portuguese Historical and Cultural Society – in collaboration with Cabrillo Civic Club No. 5 and the American-Portuguese Club Ladies Auxiliary – hosted an afternoon of entertainment and refreshments at Monsignor Val Fagundes Social Hall of Sacramento’s St. Elizabeth Portuguese National Church on 23 April 2006 , in honor of Álamo Oliveira and I No Longer Like Chocolates. Marília Wiget and co-translator Diniz Borges read excerpts from the book, poet Maria das Dores Beirão recited poetry by Álamo, the trio of Hélio Beirão and David and Julia Borba played authentic Azorean music on Portuguese guitars, and dancers from the Luso-American Fraternal Federation Youth Council #4 of Sacramento under the direction of Judy Teixeira performed Azorean folk-dances. Photo, middle right: PHCS President Terri White presents Álamo Oliveira a box of – what else? – chocolates.  Álamo confessed to the audience that, unlike the book’s main character, he really DOES like chocolates! Click here to see additional pictures of the Sacramento event and to read more about it. 10 Jun 2017 - SAN JOSE: National Portugal Day [Dia de Portugal] (Camões Day) celebration at Kelley Park (1650 Senter Road). Portuguese Heritage Publications’ book table will offer a selection of their publications for sale – including I No Longer Like Chocolates. Click here to order I No Longer Like Chocolates now.